My son is a huge fan of sensory bins. In fact even my older girls still love to play with them! But he LOVES them to the point that he will occasionally make his own! 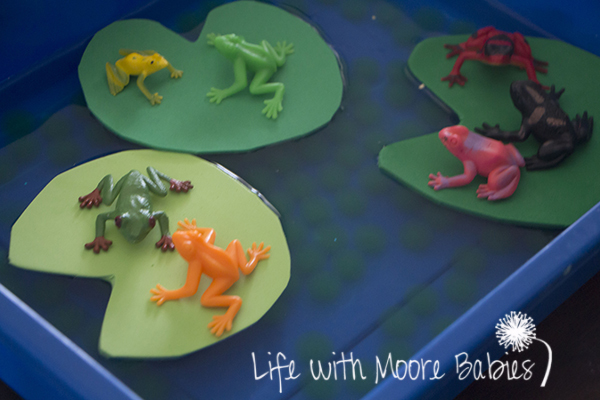 It had been a while since I had made him one, so he was super excited to see this Frog Sensory Bin, and it was perfect timing since we just started hearing the frogs around here! This was a pretty simple bin to set up. 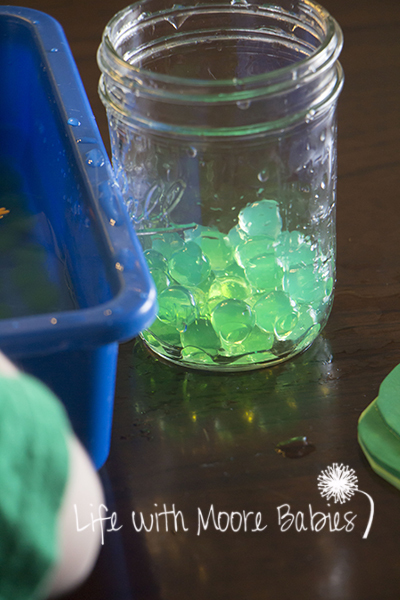 I started with green water beads and water for the base. I quickly cut some green fun foam into lily pad shapes, nothing fancy, just a shape he would recognize as a lily pad. Last thing we needed was out little plastic frogs! 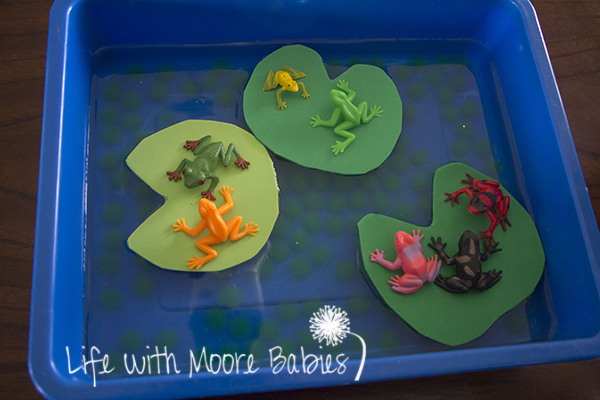 I was excited the fun foam still floated once the frogs were on the lily pads! Just making the frogs jump from lily pad to water and back was fun for him, but I thought he could use some practice in the fine motor skills of scooping and pouring. So, I provided him with a glass jar and a little scoop. He did play with the frogs alone for a bit, but once he discovered the scoop there was no turning back. He really enjoyed filling the jar with water beads and dumping them back in the bin and repeating. 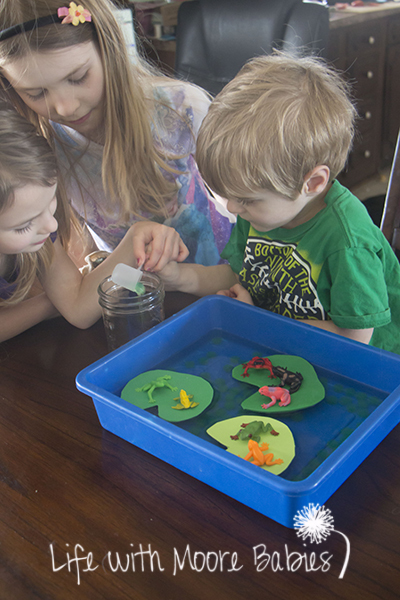 He actually got rid of the lily pads, so he could get to the water beads easier! It was a great challenge for him to see if he could scoop the water beads out without getting the table covered in water! In fact the amount of water on the table gave him a visual reminder to be careful while scooping and pouring. After a lot of fine motor practice, we dumped the water out and kept everything else for the next day. 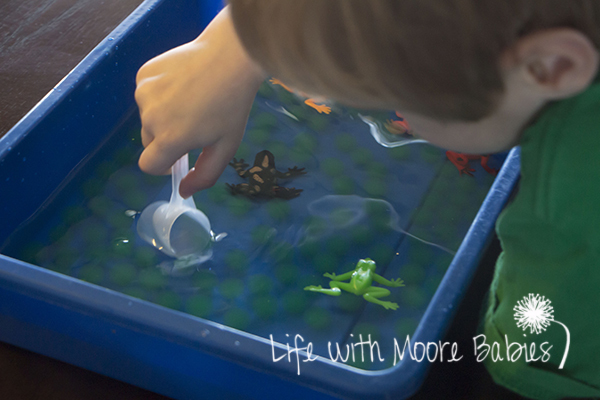 He played with this frog sensory bin a few days without water, but as soon as the water beads started to shrink, it was time to add more water. 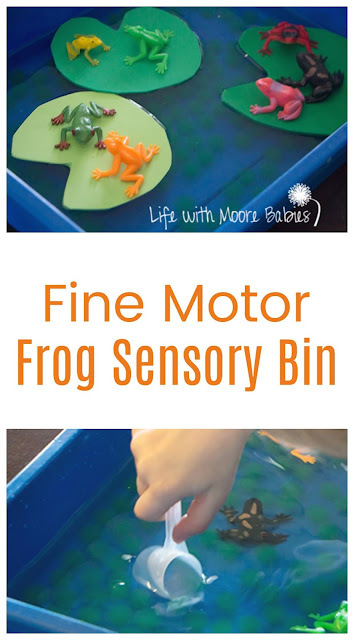 This Frog Sensory/ Fine Motor Practice Bin lasted well over a week at our house; I wonder what kind of ideas this will give him fir new sensory bins!